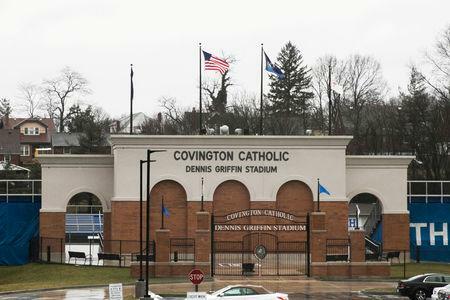 (Reuters) - A probe into a videotaped incident at the Lincoln Memorial in Washington D.C. involving Covington Catholic High School students and Native American activists in January has found no evidence that the teenagers provoked a confrontation. 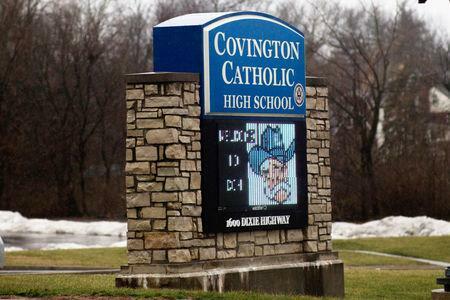 A private investigation firm retained by Covington Diocese in Park Hills, Kentucky studied the incident, which sparked outrage on social media. Its report was made public by the diocese on Wednesday. Greater Cincinnati Investigation found that the students, who were in Washington D.C. to attend the March for Life anti-abortion rally, were met at the Lincoln Memorial by offensive statement by members of the Black Hebrew Israelites. "We see no evidence that students responded with any offensive or racist statements of their own," the report found, saying they responded by carrying out a school cheer. The investigation also determined that the students did not direct any racist or offensive comments toward a Native American activist, Nathan Phillips, who waded into their group, although several performed a "tomahawk chop" to the beat of his drum. 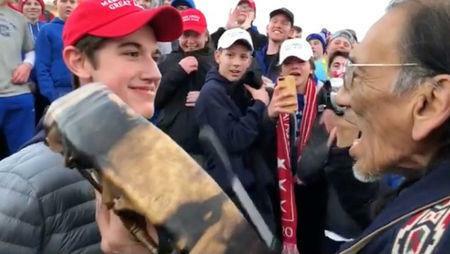 In a photo that went viral from the incident Covington student Nick Sandmann, wearing a red baseball caps emblazoned with President Donald Trump's "Make America Great Again" slogan, is seen standing face to face with the Phillips, staring at him with a smile while Phillips sings and plays his drum. Phillips claimed in a separate video that he heard the students chanting "build that wall," during the encounter. Sandman has said that Phillips waded into the group of students and began playing his drum as he locked eyes with him. “I never interacted with this protester. I did not speak to him. I did not make any hand gestures or other aggressive moves,” Sandmann said in a tweet at the time, adding that he was “startled and confused” as to why Phillips approached him. Bishop Roger Foys, in a written statement, praised the students for their actions at the Lincoln Memorial. "The immediate world-wide reaction to the initial video led almost everyone to believe that our students had initiated the incident and the perception of those few minutes of video became reality," Foys said. "In truth, taking everything into account, our students were placed in a situation that was at once bizarre and even threatening," he said.